While technically I'm supposed to be making a Postcard From Sweden quilt, since mine may have many of the colours, but not the placement, I think it looks rather like confetti. Its also probably smaller, as I'm intending it for a new baby - not a specific new baby, just one that is bound to come along in the next few months. This is just the flimsy at this stage, and I'm wondering about a navy border - I know a border is not part of the original, but once again, can't help myself doing something just a little different. 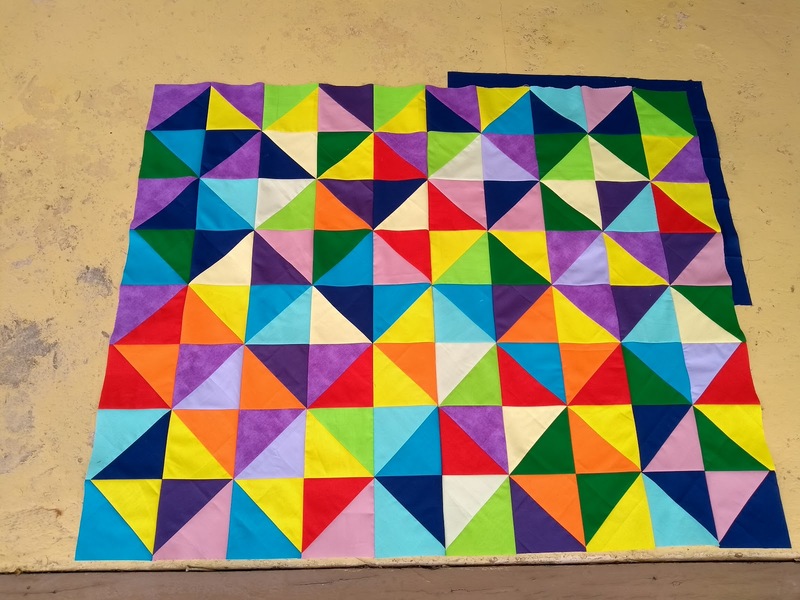 I am looking forward to seeing how others quilt theirs, whether people stick with the rows of wavy lines, or get all wild and creative. What works best? How to let the pattern and colours shine without taking away that ability to see different shapes everywhere. I've also been busy quilting a top for a friend. She thought it was just a little big for her, so I offered as I really enjoy the quilting. Can you believe she found the centre part of this quilt in a second hand shop? Just the blocks, not completed. I'm sure there's a story there, hopefully not work that family members or friends had to get rid of following a death, rather someone just shelving it for so long that in the end they just gave it away. 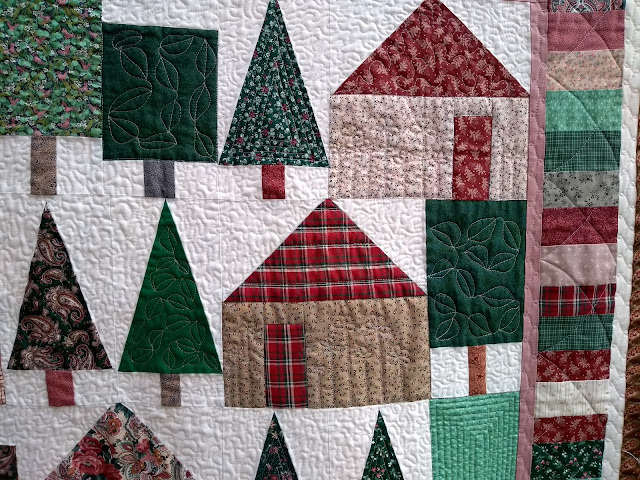 Whatever, my friend was happy to complete it and so I was happy to do the quilting. And you can't really go wrong with a stipple in the background. Since I'm away from home at the moment, I sent her the photos and she seemed pretty pleased. I'll get it back to her in a couple of weeks. 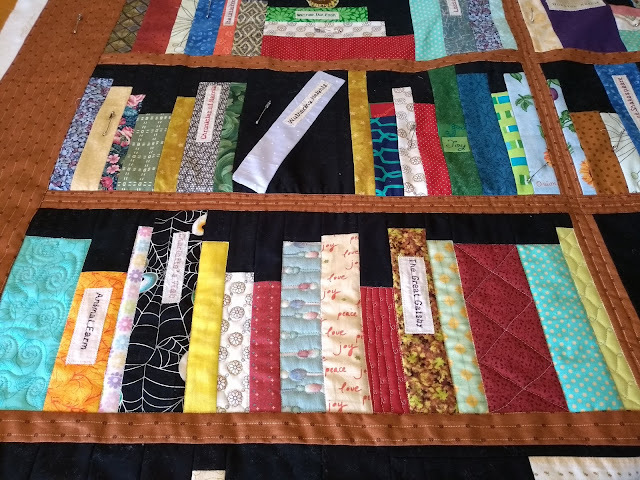 And then there's a little peak at the bookcase quilt I'm making for a friend's 60th birthday coming up. She's not a patchwork blog reader, so she won't see this here. Her birthday's not for a couple of months yet, but it's nice to get ahead of the game when you can. This is proving to be great fun to quilt. But as I packed for our holiday place, I left one vital spool of thread behind. Here it is, as my husband's still home and he took a shot to ensure he passed the correct spool to a friend who's coming to our holiday place too - how fortunate am I? I needed something that would enable me to use black thread on the top, but since the backing is much lighter, I needed a softer grey to not stand out too much, but also not show through on the top. And this happened to be in one bobbin. But of course one bobbin was not sufficient, so thank goodness for friends and husbands I say! Three projects are just not quite enough though, so I'm also working on a fourth, but more of that later next week I hope. I really like your Confetti top! I'm so glad you did a different color layout because I wondered while piecing mine if that would work. Yes it does, and brilliantly! The navy border will be very snappy, too. I like your Confetti top too. I like the brighter colors. Your friend found a treasure in that thrift store and your quilting on it is perfect. I also like the brighter colours and the purple solid that is not quite solid. Very pretty and great for a baby. Oh I love what you've done to make PfS smaller, fit for a baby indeed! It's such a wonderful pattern, isn't it? That bookcase quilt is wonderful too; some great titles you've embroidered in there. 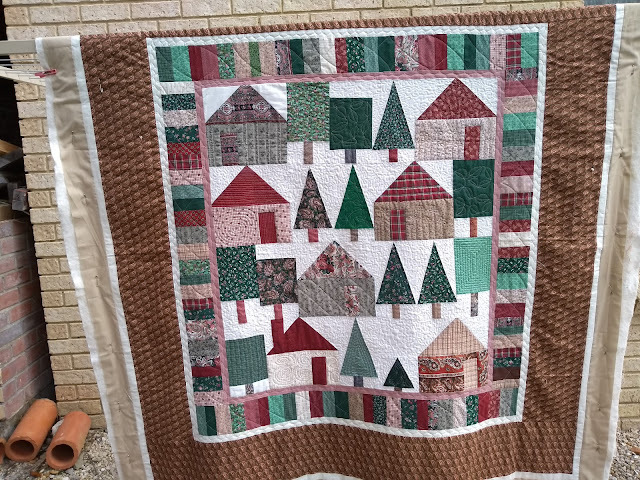 How kind of you to quilt the quilt whose blocks were in a secondhand shop-you're doing a beautiful job Lynn. Thanks for linking up and sewing along. Will you get the PfS done while you're at your holiday place?